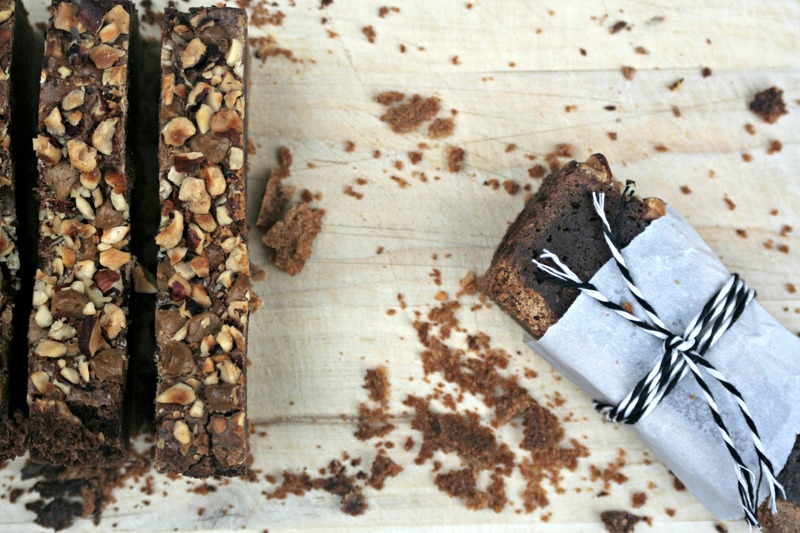 These Graham Cracker Brownie Bars are topped with coffee-infused cappuccino chips and crunchy hazelnuts, giving you a twist on the classic brownie square. Serve these as an afternoon snack or as a dinner dessert topped with gelato and drizzled with a salted caramel sauce. There are two kids of people in the world: people that love fudgy brownies and people that love cakey brownies. If you love cakey brownies, this recipe for Graham Cracker Brownie Bars will lure you into the fudgy side. So actually, there are only one kind of people in the world: those that adore brownies. Fudgy brownies that hit the spot every time. The ones that when you bite into, your front teeth are smeared with chocolate regret that tastes like heaven. 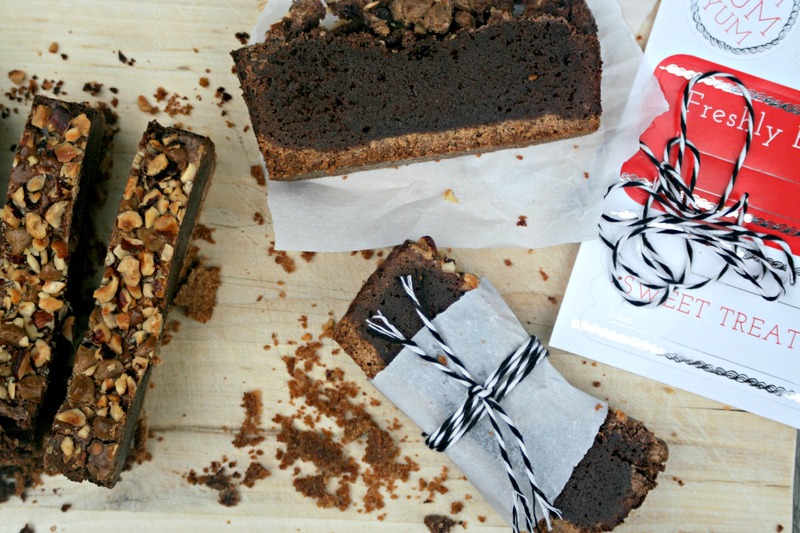 Make these brownie bars, please. If you do one thing this summer, make them and share them with friends and family. They’ll love you and you’ll love yourself as you sneak that last piece of brownie you snuck into the back of your fridge so no one would steal it. The graham cracker crust gives them a distinct texture and the topping of cappuccino chips and hazelnuts add a much needed crunch. These graham cracker crust, fudge center brownies, topped with hazelnuts and cappuccino chips will become your go to treat! Easy to make and bursting with great textures! Preheat oven to 350F and grease loaf pan. Set aside. Pulverize graham crackers in a food processor until fine in texture. In a small bowl, mix the crackers and coconut oil until the mixture resembles wet sand. Press into the bottom of the loaf pan. Over a double boiler, melt chocolate, cocoa powder, and butter. Let cool for 5 minutes. With a hand or stand mixer, whisk sugar and eggs until double in volume and light in color. Drizzle in chocolate and flour until just incorporated. Do not overmix. Pour into prepared graham cracker crust and top with cappuccino chips and hazelnuts. Bake for 35-40 minutes until firm in the center. To serve: refrigerate overnight for better cuts. Slice with a warm knife and serve! Cacao Barry Chocolate: one of the best chocolates in the world and what a lot of professional pastry chefs use at homes and in their restaurant kitchens. This particular one, the Saint-Domingue is “Hispaniola, a blend of Forastero, and Criollo, combines an exceptionally long finish and produces a dark chocolate with a very pronounced cocoa flavor”, and works very well with how pronounce the chocolate flavor is. Divine Chocolate Cocoa Powder: to make the chocolate flavor even more pronounced, I added a couple tablespoons of this cocoa powder, made from 100% fair trade cocoa. Not only is Divine Chocolate great for baking, but their milk chocolate bars are crazy delicious! Zulka Morena Pure Cane Sugar: I’ve been baking with Zulka for the past two months in different ocassions after getting a sample in the mail and I can honestly say I’ve loved the way it performs. It’s raw sugar, with no added processes and it’s non-GMO. Unlike regular white granulated sugar, this sugar is light brown in color naturally and enhances baked goods with caramel notes. Einkorn Flour: with a lower gluten percentage than regular wheat flour, and grown in the USA, “Tropical Traditions einkorn is grown on family farms in Washington State. Tropical Traditions Organic Whole Grain Einkorn Flour is the whole ground up einkorn grain, retaining all the nutrients.” I’ve baked with it in a variety of recipes and it performs just as well as “regular” all-purpose flour. these bars look awesome!!! I love the idea of cappuccino chips and raw hazelnuts! These would make for perfect after dinner dessert or even better lunch box treat! Oh yes, what Heather said, heh heh. This looks insanely good! Fudgy brownies are the only kind of brownies in my book. And these bars are INSANE levels of deliciousness! 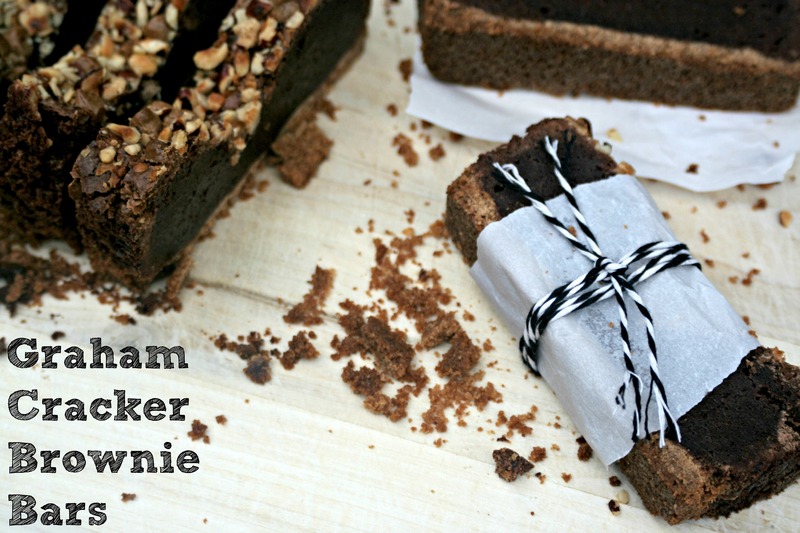 Oh goodness these look like a loaf of brownie, which is just amazing. I love the idea of grahams! Spread some fluff on it, and it’s like a s’more brownie!